Oyy, these official stills are just adorable. Did you know that Jo Jung Suk is actually older than Shin Min Ah, but she’s the more widely known of the two? He’s four years older and all these years, I kept thinking he’s in his late twenties and his luck in snatching a hubby role opposite noona Min Ah. Then I checked their profiles today and it surprised me. Despite her sweet face, Min Ah’s graceful manners give off a mature vibe, and yet he’s the oppa! Do you need more reason to catch My Love, My Bride in theaters? And I pray that they remain blissfully as siblings (cause really, I don’t need the extra competition! 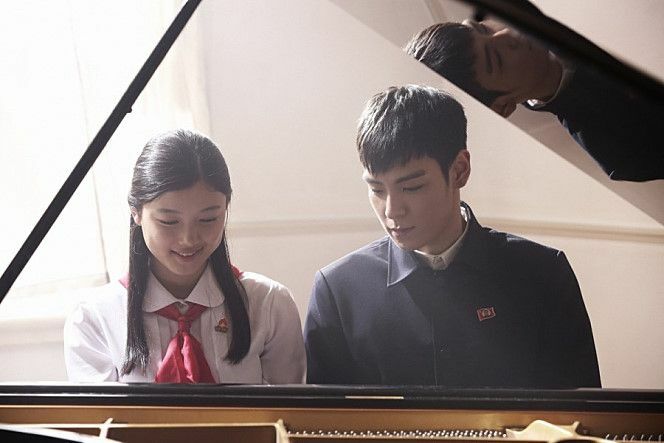 😛 ) The two cute stars are everywhere this past week together to promote for their upcoming film, The Commitment, where TOP takes the role of a reluctant North Korean spy and suffering brother whose failed mission resulted in his sister (Kim Yoo Jung)’s containment in the labor camp. Hmmm, South Korea must really like North Korean spy-themed movies or what? Let’s just hope this one has a better ending than Secretly Greatly.